Large gypsy moth caterpillars now present; mating disruption treatments begin. 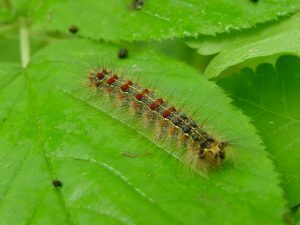 Mature gypsy moth caterpillar with distinctive blue and red dots. By late June, gypsy moth caterpillars will be large (>1” in length) and noticeable in most of Wisconsin. Nuisance caterpillar problems and defoliation from the caterpillars will be apparent by now, even in the far northern counties. As of mid-June, we have only had a few reports of nuisance caterpillars. This is a hopeful sign that populations will remain low in 2018. The June rainstorms will also help the Entomophaga fungus to kill gypsy moth caterpillars. The Wisconsin Department of Agriculture, Trade and Consumer Protection (DATCP) has begun mating disruption treatments in western Wisconsin counties as part of the Slow-The-Spread Program. Low-level, isolated colonies are treated with the female moth’s pheromone (scent) to prevent male moths from finding female moths. This technique is only effective at low populations and is not used in the DNR Suppression Program because populations are far too high in the areas where the DNR sprays to protect trees from heavy defoliation. For more information on the Slow-The-Spread program and to view maps of the treatment areas, visit the Wisconsin gypsy moth website. Predicting next year’s populations levels can be started in September once all of the egg masses have been produced and adult moths have finished their life cycle. More information is online about control methods for yard trees and predicting next year’s population levels. If you see large numbers of the caterpillars or egg masses in your trees, contact your community’s Forestry or Public Works Department to report the gypsy moth infestation and request that the community consider participating in the Suppression Program. A directory of local gypsy moth contacts can be found online. Woodlot owners can contact the County Coordinator directly in most cases. Applications for the 2017-18 Suppression Program are due in early December 2017. The state’s one-stop shop for information on gypsy moth and its management is the Wisconsin gypsy moth website. Homeowners seeking assistance can also call the DNR gypsy moth hotline, 1-800-642-MOTH. Written by: Bill McNee, Forest Health Specialist, Plymouth (Bill.McNee@Wisconsin.gov), 920-893-8543.